Add "Accept Invitation" link/button/function to Group and/or Site invitation emails? Added by Luke Waltzer 11 months ago. Updated 11 months ago. Right now, when a user gets an email inviting them to join a group or a site, the email includes a link to that destination and a link to the manage invitations page. Not sure how we didn't think of this before... but shouldn't the email also include a link that allows someone to accept the invitation from the context of the email? Otherwise, they have to know to click on the second link in the email and that they have to go to their manage invitations page before they can accept the invite. One-click acceptance would only work for known existing members. Ray, I assume there are technical issues in the current implementation that would require some work - nonce checks and the like. One could argue that we want people to go to the site to do this kind of action, since it will remind them of other pending invitations, notifications, etc. This would weigh in favor of not having one-click acceptance. If the concern is that the Manage link is buried, we can probably mitigate with improved formatting/language in the email. That's correct. If we added the nonce to the accept/reject URLs to the email, nonces in WordPress expire in 24 hours by default. So if someone clicked on those links after 24 hours, they would become invalid and would not work. I think changing the wording in the email is probably the easiest fix. I would suggest we take a two-pronged solution. 2. I think we can explore a one-click acceptance of group membership separately and don't see it as a big deal if the link expires after a day as long as we make that expiration clear. The problem with the suggested email copy is multiple groups (and sites) can be chosen when inviting a user. 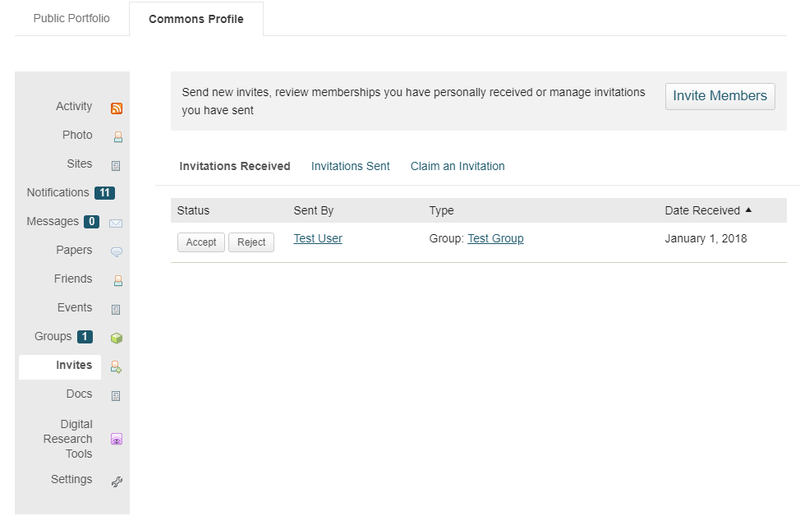 Click here to view all your [pending invitations](link to invite management screen). Once on their invite management page, the user can then choose to visit the group and site homepages if desired. Thanks, Ray. Can you please make the following changes, too, if you haven't already done so? I think we should put this in as a hotfix if possible. thank you for all of your work on it. This is live on production. Ray, I think that the request was in reference to the email content, not the Manage Invitations page itself. I've made a modification to the email, which you can see in the screenshot. It adds a header for visual differentiation and changes the link text. If you'd like something different, please be specific so that we can implement it. The attached screenshot shows the changes.